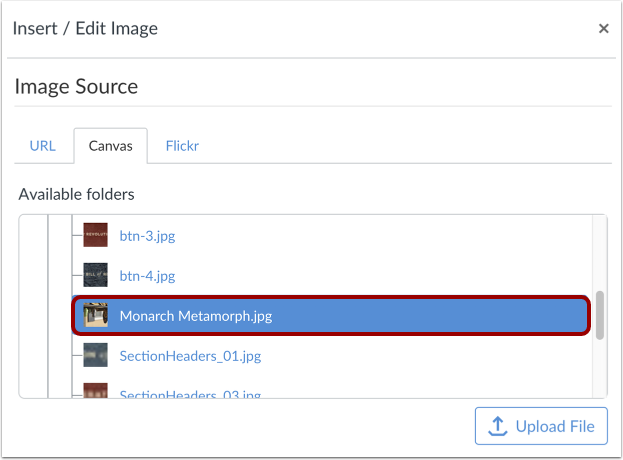 You can upload image files to your files in Canvas and embed them in the Rich Content Editor. You can also add alt tags to your images for better accessibility. 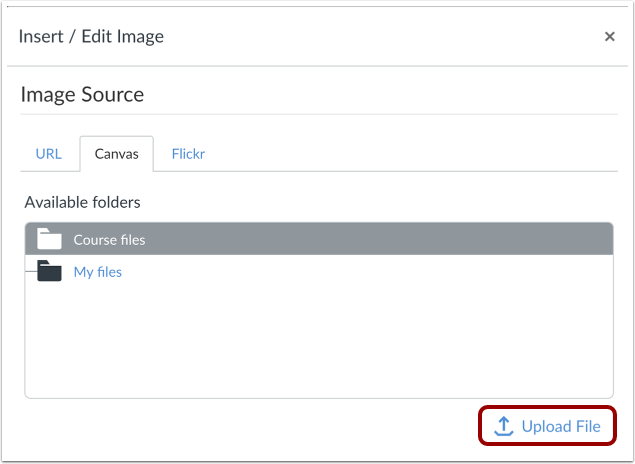 As an instructor, you have the option to upload images to your course files using the Content Selector. 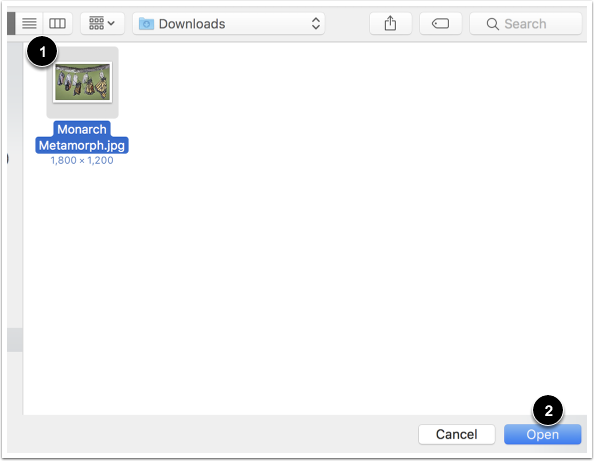 If a change is made to the image in your personal files after it has been embedded, the image you have added to the Rich Content Editor will not be changed. 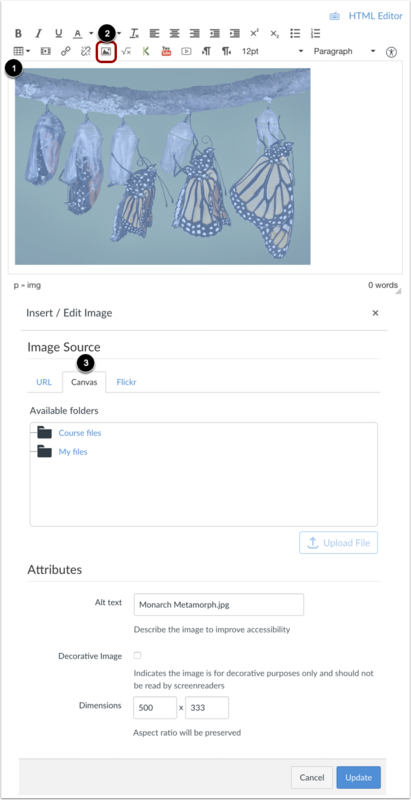 You can choose to embed images located in your course files  or your personal files . 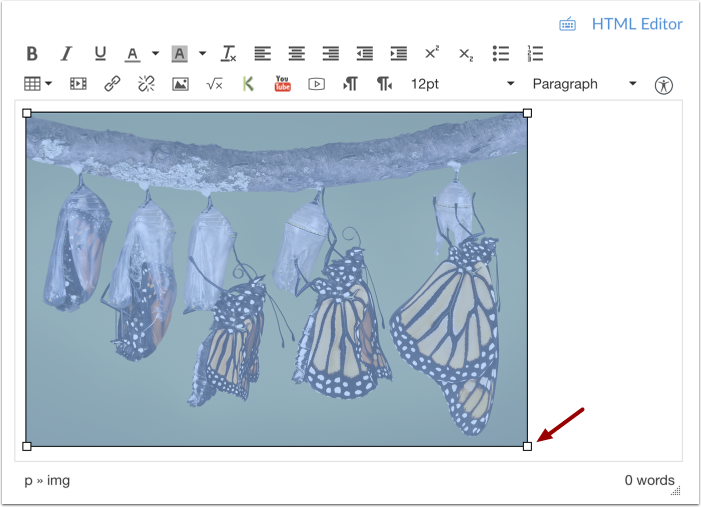 As an instructor, you can embed any image from your files into the Rich Content Editor, even images that are in folders not visible to students. To embed a previously uploaded image, click the image you wish to embed. 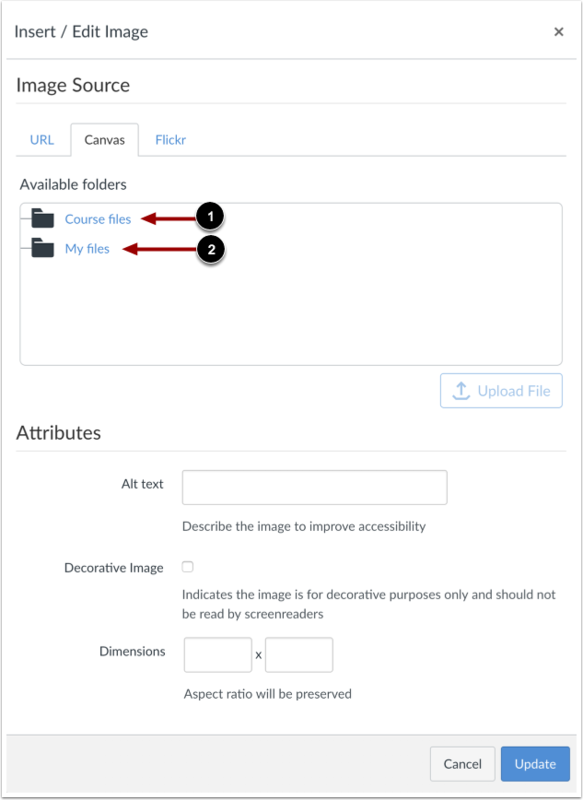 To upload an image to embed, click the Upload File button. In the dialogue box, select a file to upload . Then click the Open button . The Attributes field will populate the Alt text field , which is the name of the image. 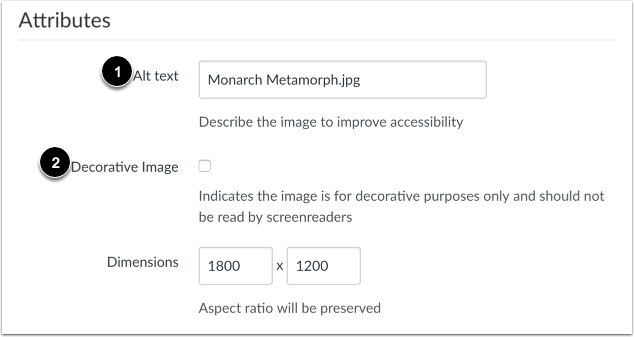 For better accessibility, type a description of the image contents. To add the image as decorative, click the Decorative image checkbox . If the Decorative Image checkbox is selected, the alternative text field is grayed out. The image’s default dimensions will also populate automatically. Dimensions are referenced in pixels defined by width then height. 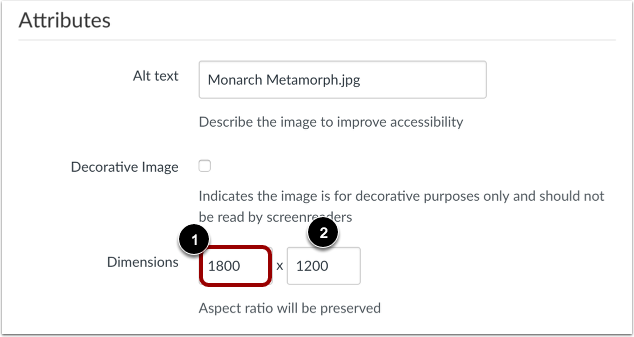 To change the image dimensions, type in the number of pixels you would like for the new image width . Then press the Tab key on your computer keyboard. 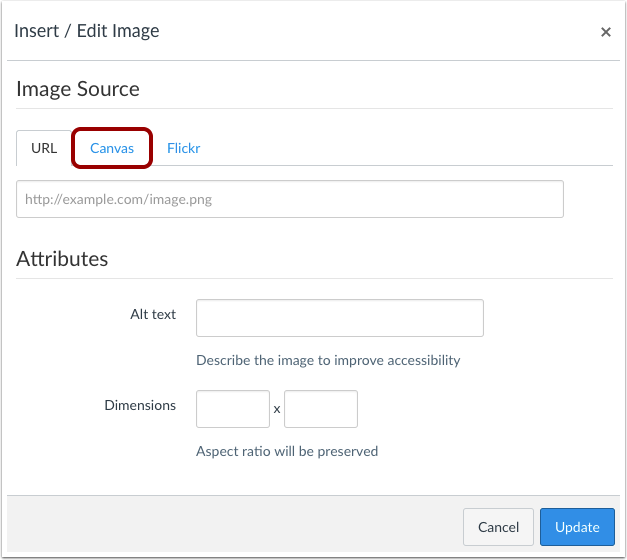 Since Canvas maintains the aspect ratio of your image, the entry for the image height will be changed automatically . Note: As a future shortcut, if you do not need to change any of your image's attributes, locate your image and simply double click the name of your image. The image will be embedded directly to your post. 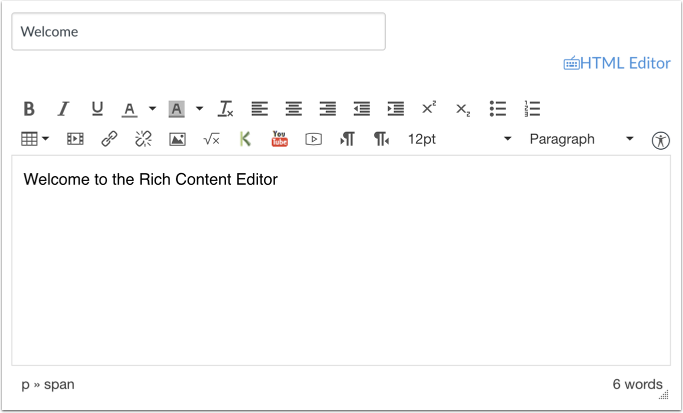 View your embedded image in the Rich Content Editor. To edit an existing image, click the image , then click the Image icon . The insert/embed window will appear to make changes. When you edit an existing image, the URL tab will display the location of the Canvas image; however, the Canvas tab will still display the file. The attributes will remain the same across all tabs and can be edited as necessary. 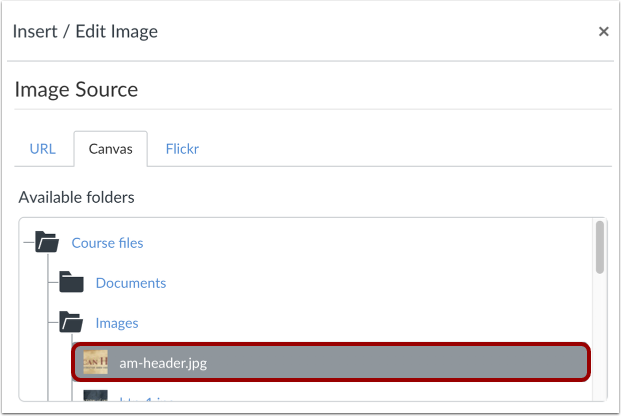 If you want to replace your Canvas image, click the Canvas tab  and locate another image. You can also use the handles around the image to visually change the image size. To do this, click the image, then hover over one of the white bounding boxes until your cursor becomes an arrow. Drag and resize the image. Please note that the image will always retain its aspect ratio as to not become distorted. Previous Topic:How do I use the HTML view in the Rich Content Editor as an instructor? Next Topic:How do I embed images from Flickr Creative Commons in the Rich Content Editor as an instructor? 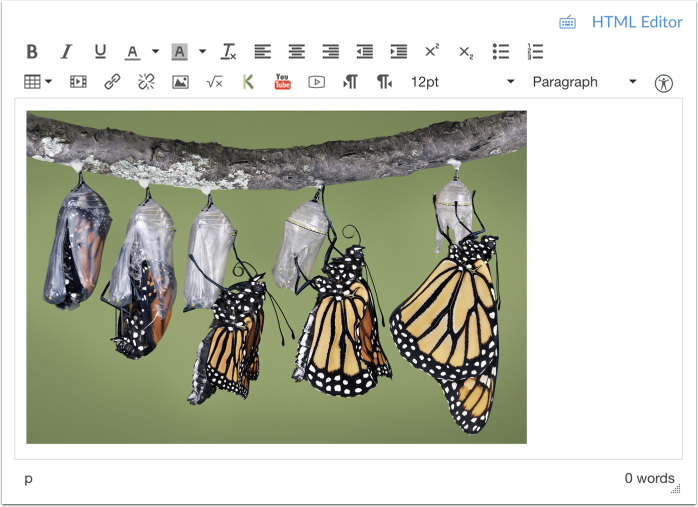 Table of Contents > Rich Content Editor > How do I embed images from Canvas into the Rich Content Editor as an instructor? Re: Embed a power point slide ?